Archer was a "stray pick-up" in LA and had a rough start at the shelter. They believed he was hit by a car. A wonderful and large community of volunteers came together to rescue, foster, and provide Archer a state-of-the art orthopedic surgery to realign his pelvis. Woody is 1-2 years old Shi Zhu mix about 11 lbs. 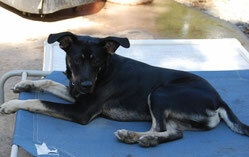 He is a neutered male, very good with other dogs and people who he has met. Woody just joined DOGzHAUS rescue and more information coming soon!! Fiona just joined DOGzHAUS on 01/14/2016 and more information and new picture will be coming soon! She is 10 months -1 year old German Shepherd mix, about 45 lbs. Good with other dogs and people. She's 1.5 yrs old, spayed and got UTD shots. She is a very sweet girl who would love to play and give you kisses all day! 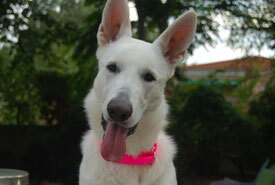 As a young dog, she loves exercise and needs some additional training to be an amazing adult dog. She already got some basic training and walks well on the leash. She is good with other dogs. She is okay with most cats but can be a little selective if the cat is not confident. Mochi just joined DOGzHAUS rescue. 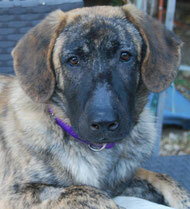 8 months old, neutered male, 68lbs, good with other dogs. He came to local shelter as owner surrender and DOGzHAUS rescued him right before his time was up there! He is currently at his foster care and waiting to find his forever home. He is amazingly quiet and mellow, great with other dogs and people any age including small children. Because of his mellow personality, he prefers a quiet environment and is scared a big noise. He rarely barks. He is good on leash and walks well. He can be a perfect dog for someone, maybe you? Please help us finding his FUREVER home!! 9-10 years old, neutered male, 60lbs, microchipped, UTD shots. He is in GREAT shape! 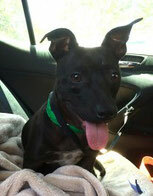 She is a 7 month old spayed girl who is super sweet and great with everything she meets including other dogs and cats. She is currently about 55 lbs and will be bigger when she is fully grown. This pretty little lady is as sweet and delightful as her name implies! 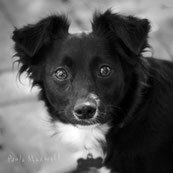 She was described an 11lb female adolescent Spaniel mix by the high kill shelter she was rescued from just in the nick of time. After spending some time at the vet being treated for kennel cough and getting spayed, she now lives in Eagle Rock with her foster mom and another small dog and a cat. She is adjusting very well to the good life away from the noisy shelter. She is doing a great job learning her house manners and leash skills. Strudel is a gentle, sweet soul that loves giving kisses and cuddling up in your lap or having quiet time in her cozy crate with her stuffed animals. She is young, though, and still has that playful puppy energy and enthusiasm. She’s friendly with all of the dogs she’s met and even cats! Most of all though she loves people and steals the heart of every person she’s met. Treat yourself to Strudel. She is a super sweet girl that will be your best friend and never leave your side. He came to the shelter in Riverside as a stray and was going to be euthanized. We got a call and visited the shelter to rescue him in last minute!! He currently lives with his foster's dogs, and cats, and is getting along with all of them. He is very submissive and loves everybody he meets. He is learning a lot of new things at his foster care and doing great. He knows some commands, walks well on leash and loves to sleep. This great puppy is still looking for his forever home and waiting to meet you!!! This adorable girl is available for adoption!!! She was rescued from a distant high kill shelter by our rescue organization. She came to the shelter as stray very under weight. However, she LOVES everybody she meets even though she experienced the scary street life and the shelter life.... She is great with all people including small children.She is great with other dogs any size and cats. She can be very playful as a puppy but is usually very calm, quiet and lying on her favorite doggie bed all day. She is NOT a barker. She does not dig in the yard or chew furniture either... she really is a great puppy!!! . She is micro-chipped, UTD shot and spayed. She is currently 33-35lbs as a puppy and we believe she will be about 50-55lbs when she is fully grown. . She is a happy girl who makes others very happy. We hope she finds her forever home soon!!! 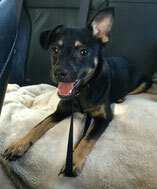 He is a young male terrier mix with lots of puppy energy and playfulness. He looks like a mini Irish wolfhound and only weighs 10-11lbs!!! His coat is very unique with white/silver/brown/grey markings....and he's non shedding! DOGzHAUS rescued him from local high kill shelter and now he is living in Los Angeles at a foster home with another dog and a cat. 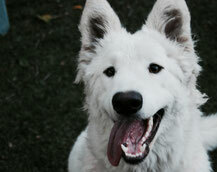 He is very friendly, playful and good with other animals. He loves toys and being held. He rarely barks. He will make a great addition to a family with kids, someone looking for a running buddy and or a second dog. He gets along with everyone and everybody he has met has fallen in love with him... but he is still looking for his forever home!! He is micro-chipped, UTD on his shots and recently neutered. They are about 12 lbs, seem very young, already neutered/spayed and got UTD shots. Benny and Lola were rescued from East LA area after they were dumped on a street littered with trash. They, along with their two puppies were left there to fend for themselves, dodging delivery trucks and sleeping under parked cars. It took us most of a day to gain their trust, and once we did, they turned out to be gems. When we questioned people in the area factories, they said they had seen a man leave them there on the street. The man said someone was going to come and pick them up. After several days had passed, a local employee contacted a friend and we got word of the dogs' whereabouts. They appear to be great with all people, very relaxed. Benny, in particular, likes a lot of human contact and affection. Lola is extremely affectionate with the other dogs. Both Benny and Lola are okay with cats as well. 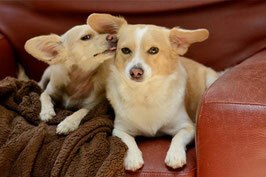 Benny and Lola are very bonded and we are hoping they find their forever home TOGETHER. Currently, they are safe and in foster care... waiting to find their forever home. 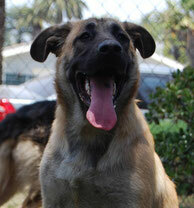 He is approximately, 2 years and 2 months old neutered, vaccinated and completely healthy. He was rescued from a local Shelter (Los Angeles) on 3/27/2015 the day before his scheduled euthanasia. We don't know much about his story before he came to the shelter. Animal Control just said he was abandoned, so it seems he came to the shelter as Owner Surrender, but his previous owner did not leave any notes. He hasn't been out much before because he is learning everything from the beginning and still acts like a young puppy sometimes. He's very friendly with all dogs, and wants to play with all of them. As far as we know he has no experience with cats. He's good with children he has met but the foster does not have children in the home. Fully house trained, good on leash and no sign sof aggression. 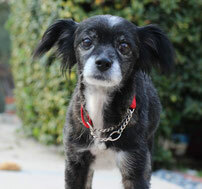 He is currently in foster care in the Redondo Beach area and lives with his foster's own dog. DOGzHAUS rescue group rescued him from the local kill shelter before his time was up! The shelter said he was 8 years old... but we believe he is actually younger. He has very clean teeth and looks too good for an 8 yr old dog! He is super mellow, very quiet and not so active at all, so maybe it made the shelter think he was an older dog. 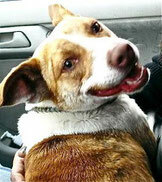 He is great with people, other dogs and cats... has a beautiful white/brown hair... He is neutered, UTD shot and microchipped. 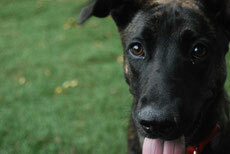 Roger is 6-7 months old Dutch Shepherd/German Shepherd/Plot Hound mix. He is currently 60 lbs! Freddie was found running on the freeway at night. He was followed to a dumpster where he had been surviving on scraps. After being given some TLC, Freddie is now a very affectionate sensitive boy who loves cuddles and treats. Freddie will play fetch anytime of day or night and will sleep under the covers cuddled up with you if you let him! 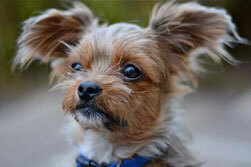 Freddie will do best in an adult home with an experienced dog owner where he is the only pet. He could do well with another dog, as long as they are at least midsized. He recently graduated from obedience class. 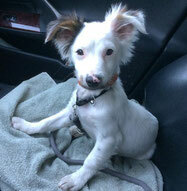 He is neutered and vaccinated, aplayful joy, and loves to practice his tricks for his favorite treats (carrots!) and greets you with a happy wagging tail and many kisses. DOGzHAUS rescued her from local high kill shelter at her last day before being euthanized. We thought she definitely needed a help to find a loving forever home. Like the song says, "She's a beauty. A one in a million." Trust me, you will totally fall in love with Misty. He looks just like a puppy even though he is fully grown. 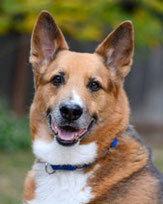 Not much is known about his life before he came into a local high kill shelter as a stray and was rescued by Dogzhaus. Now in foster care, it is clear he was once someone's beloved pet. He has wonderful house manners and is well socialized with both people and dogs. People of all sizes and ages are his friends as well little dogs. He is somewhat fearful of the larger breeds. He walks okay on leash but is still working on his leash training due to his leash reaction. He has a healthy appetite, but prefers affection over treats and toys. He likes walking, People of all sizes and ages are his friends as are little dogs. He is somewhat fearful of the larger breeds. He walks okay on leash but is still working on his leash training due to his leash reaction. He has a healthy appetite, but prefers affection over treats and toys. He likes walking, car rides, napping, lap sitting and pretty much anything you throw his way. He's very eager to please. Orlando will come when called. He happily spends the night in his crate. He is wonderful dog who will make a great furry friend for an individual or family. WON’T YOU BE MY FOREVER HUMAN? He also seems to do well with other dogs! He’s a bit shy with strangers at first so new humans just need to be polite. But shouldn’t everybody be? Sims warms up quickly and just needs to know you’re a friend. And then he couldn't be happier to see you! A North Central Shelter alum, Simba had a possible owner who never came for him. He has a lot of fans out there who know what a great dog he is and couldn't believe anyone would let him go. He would make anyone a wonderful companion. He LOVES the ladies. And is as smart as can be. Please consider this handsome boy for your forever friend! Simba has been fully vetted and checks out a-okay! Beautiful 2 year old Chloe came to the shelter when her Owner Surrendered her in very poor condition. Currently, she is under weight and needs treatment for her skin condition. DOGzHAUS rescued her and is providing her the medical treatment she requires to blossom into the beautiful girl we all know she is. She is very sweet and affectionate. 48 lbs, spayed female, black and tan. Our rescue group is very happy to take this sweet senior and find her forever home! MOLLY POLLY is an 9 year old Pekinese/Papillon mix. She is currently 13 lbs and a little under weight. DOGzHAUS rescued her from local shelter before her time was up! She came to the shelter as a stray dog but had a microchip. The shelter contacted her previous owner. Unfortunately they did not want to her back and would not come pick her up. 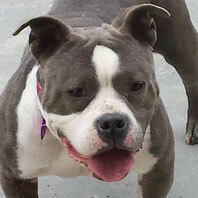 Amy came to local shelter as a stray with torn ACL. She has a lovable personality and very affectionate. DOGzHAUS rescued her and provided the vet care she needed. Her torn ACL was not so bad. Luckily, her vet said she did not need a surgery if we manage her well. She loves EVERYBODY she meets and steals EVERYBODY's heart. She is great with any people including small children. She loves other dogs in any size and does not really react to cats. The shelter said she was 8 years old but we actually think she is a little younger like 6. She is a spayed female and 55lbs. A wonderful lady found him walking toward to freeway ramp near Highland Park area. She tried to find his owner but no luck. Unfortunately, she could not keep him so she contacted us for help. We were happy to take him into our rescue group and kept looking for his owner. After 30 days passed, he was up for the adoption. He was adopted by his foster. 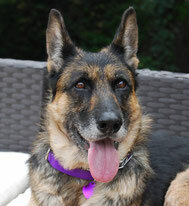 Beautiful Millie was just rescued from local shelter and joined DOGzHAUS. The shelter said she was 8 years old but we believe she is 5-6 years old after confirmed with the vet. She is 86 lbs, spayed female, very sweet, loves toys (specially balls), nice with anyone she meets and seems good with other dogs. We will have more information about her once she is settled down at her foster care. Asta just joined DOGzHAUS rescue because his owner recently passed away and he had no where to go. He is 4 years old Mini Schunauzer. More information is coming soon!! 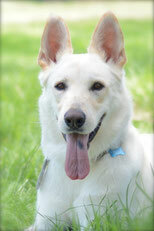 Beautiful Kai is 4-5 years old neutered male White German Shepherd. 73 pounds. It's a treatable/manageable condition and can be completely healed as well. DOGzHAUS decided to rescue him from high kill shelter and has been provided the medical treatment he needed. Currently, he is in foster care and has been showing big improvement. He quickly warms up to people. Kai is good with all dogs, cats, and children. He is playful and very affectionate. He was very depressed at the shelter but is spritually doing a lot better now. 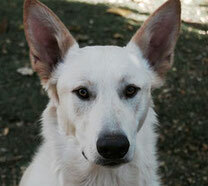 He is looking for his forever home and forever people who can provide him unconditional love. 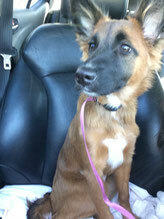 Poppy is 4 months old Belgian Shepherd mix. DOGzHAUS recently rescued her from a distant high kill shelter. She is currently 22 lbs. We believe she stays in smaller size of shepherd and grows up to 40-50 lbs. She is very sweet and great with everything she meets including small children, other dogs and cats. Mo is now available for adoption !! 7 months old neutered male, 38lbs. after we rescued him, we took him to several vets and found out his leg was going to be completely healed without amputation. 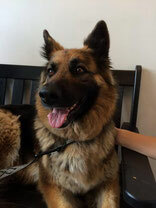 However, Mo visited the vet often for treatment and was very patient during the healing process. Now he does not need a bandage any more and is ready for adoption. He runs, jumps and plays like a normal dog and can't tell he was very injured few months ago. He loves everybody including any size of other dogs, cats, people, kids,.... he is a medium energy dog who needs a morning exercise but takes nap all afternoon. Great on leash and car ride! He will be a great family dog with small children as well. Darby is only 7 months old! He looks like a mini Shepherd! but actually we think he is Chihuahua/Mini Pin mix. He is neutered male, 9 pounds, great with other animals (small to large size of dogs, cats, etc..) He gets very curious when he meets new people... just like 3 years old human kid... he warms up quickly with women in few minutes but may need longer (few hours to few days) with men. He has no aggression at all. Spanky is 5-6 years old neutered male chihuahua. Only 8-9 pounds! He was very traumatized from 3 months of high kill shelter experience. He was always worried, scared and nervous. DOGzHAUS felt really sorry for this tiny boy and decided to resuce him. DOGzHAUS felt really sorry for this tiny boy and decided to resuce him. We provide rehabilitation care at his foster home so he could relax and be the dog he always was meant to be. He came out of his shell and is currently a happy boy. He is very interested in new people he meets. He loves toys (tennis balls) and great with other dogs. 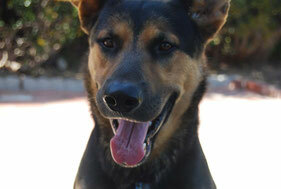 He is approx 2/yo, neutered, 75 lbs, microchipped, UTD on his shots including rabies. He was found on the streets of Los Angeles and brought to the local high kill shelter by animal control. He waited for his owner but no one came to claim this wonderful boy. He was very sad in the shelter and tried very hard to get my attention when our rescue team visited the shelter. We decided to save this preceious boy in order to help him find his new family. He is a sweet submissive boy and listens well to a handler. He is a neutered, housebroken, and gentlemanly little Bichon mix. Although his chip says he is 5 years old, the vet would have guessed he is younger because of his excellent health and playful demeanor. He is cuddly, gentle, and affectionate; when you pick him up, he wraps his arms and legs around you like a toddler. 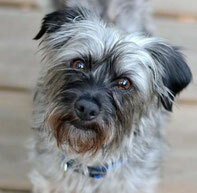 Although timid about new things, Sigmund warms up quickly into a joyful guy who loves to play with toys and other dogs. Great with kids and other pets, too. Only 12 lbs! 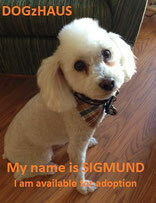 Sigmund is a friendly, devoted companion who just likes to be near you. He has wonderful house manners and only get on furniture when invited. He would be happiest in a home where he could have another dog friend and a yard to play in, but he's so sweet and eager to please that he would fit in anywhere. We just rescued Rosie from local high kill shelter. Meet Bleu! He is 4 years old, neutered male, 20 pounds. He loves to play with toys and other dogs. He is an active dog who needs a daily exercise. He walks very well on leash and listens to a handler as well. He can warm up with new people quickly but takes 10-15 min to be okay with other dogs. (very normal) He came in the local high kill shelter as Owner Surrender and left behind a long time. He just came into our rescue group so we will update his information as soon as we know him better. spayed female and only 33lbs! The name Zara means "light". It has been said that people with this name have a deep inner desire for love and companionship, and want to achieve peace and harmony. They tend to be courageous and unique. Our 5 year old Zara lives up to her name in every way. 1 year 2 months old, Dachshund mix, 21 lbs, neutered male. He lived with his previous owner who was homeless on the street before he came to the shelter. Hansen has a very sad story. The police officer took him away from his previous owner because his tail was stepped on by 5 years old child at the park so he tried to run away and it scared the child. He was at the shelter over 3 months and marked as "Rescue Only". 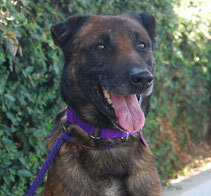 Hansen is actually very sweet, gentle, friendly and loves people. He was going to be euthanized in 24 hours when DOGzHAUS arrived just in time. Meet Marley and Nora. 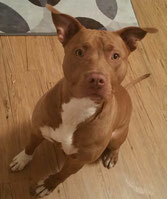 Only 10-12 months old, spayed female, 20-22 lbs. They are from a same litter and very bonded! They came to the local high kill shelter as Owner Surrender and were terrified being there. DOGzHAUS decided to rescue both of them together and find a forever home as a bonded pair! 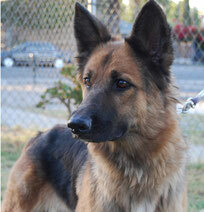 Sasha is 2.5-3 years old, young spayed German Shepherd. She is only 45 pounds as an adult dog! 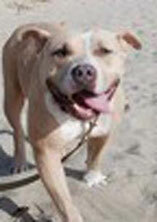 She is super mellow, loves everybody and seems great with other animals. She was on the street around Los Angeles downtown area, dragging a chain and very sad. She was brough to the local shelter but her owner never came to pick her up. She was losing weight from stress and hunger, so we decided to rescue her and give her a second chance. She is currently gaining few more pounds at the foster care and doing very well. She is very gentle and quiet. She is smaller than a regular size of German Shepherd Dog.